Home Car News Tech What is Apple CarPlay? ► What is Apple CarPlay? ► Will your car sync with CarPlay? Even if you’ve got an iPhone, there’s a very high chance you use Google Maps – and that’s because Apple Maps really isn’t great. And while it’s easy to use Google’s map service when you’re on your iPhone, when you’re using Apple CarPlay, you’re forced to stock with Apple’s own hit-and-miss navigation service. Well, that is, until now; iOS 12, Apple’s latest update for current iPhones, will let you use Google Maps with Apple CarPlay. That might not sound like a huge deal, but if you’re an iPhone Google Maps user, it will make using Apple CarPlay a far more familiar experience – and probably a more accurate one, too. Here’s how to download the new iOS 12, and keep reading for everything else you need to know about Apple CarPlay. We use our mobile phones pretty much all the time, and for good reason. They’re the most connected, personalised piece of technology we own, so when we jump into a car, things can be a bit jarring. Despite what car manufacturers say, vehicle infotainment systems just aren’t as familiar or intuitive as your own iPhone – and unless you’ve worked out how to sync the two, they won’t contain your personal information and data, either. So, what if there was a way you could easily send everything from your smartphone to your car’s dashboard? If you’ve got an iPhone, there’s an already a way to do it: Apple CarPlay. Simply put, Apple CarPlay is a way of connecting your iPhone and everything it contains to your car’s infotainment screen. 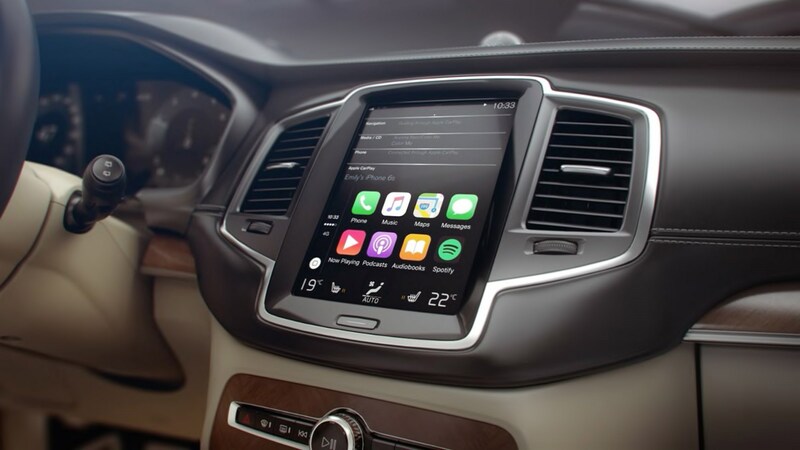 When Apple CarPlay is active, your car’s display will look a lot like your existing iPhone held on its side, and will show CarPlay compatible apps on your home screen, such as Spotify and WhatsApp. You’ll even find a very Apple-style home button to the left-hand side of the screen. How does Apple CarPlay work, is it easy to set up? CarPlay is something that has to be certified by Apple, and that means you’ll have a near-identical experience in any car that has it. Almost every car with CarPlay certification simply requires you to plug in your iPhone via USB. Once you do, you’ll be asked if you want to activate Apple CarPlay automatically there and then, or access it later via your menus. Some systems will also ask if you want CarPlay to activate automatically every time you connect your Apple smartphone. Some new cars, such as the new Mercedes-Benz A-class, will also feature wireless Apple CarPlay, so you won’t even need a cable. They connect instead over Bluetooth. Is my car CarPlay compatible? If your car is relatively new, chances are it’ll have Apple CarPlay - and you’ll have been told about it, too. If not, Apple has published this exhaustive list for you. If your car isn’t on that list, you can still get Apple CarPlay via an aftermarket infotainment system. Alpine, Clarion, JVC, Kenwood, Pioneer and Sony also make CarPlay-certified systems. Is my iPhone CarPlay compatible? If you have a non-Apple phone, you should’ve guessed by now that it won’t work with Apple CarPlay. We’re surprised you got this far, to be honest. If you own an Android phone, you’ll be looking for Android Auto connectivity instead. So, is Apple CarPlay worth it? Unlike head-up display (HUD) technology, Apple CarPlay is a far more subjective piece of technology; and its usefulness will largely depend on how you use your iPhone, the sort of media you consume in your car – and if you’re that tech-savvy. For people who dislike the infotainment systems in their cars, Apple CarPlay is a magic bullet, and provides a largely intuitive, familiar interface. And it comes with all your contacts and music already nested in your car too. But if you’re already used to your car’s infotainment system, happy with its sat-nav, its music streaming capability and its ability to make phone calls – you’ll find less benefit to Apple CarPlay. Thankfully, in most cars nowadays, Apple CarPlay comes as a standard piece of equipment, so you won’t necessarily find yourself shelling out for it. But some manufacturers like BMW still charge a premium for it; Apple CarPlay preparation on a 1-series costs £235 in the UK at the time of writing. It’s always worth haggling with a salesman, as they may throw in the Apple connectivity if you ask for a discount. If you want to Apple CarPlay with an aftermarket product, expect to pay something like£300 and upwards for a system that also supports the technology.